If you’re looking for a delicious vegan entree or side dish, this Moroccan-inspired, 9-ingredient recipe satisfies all of the above and it’s also gluten-free! 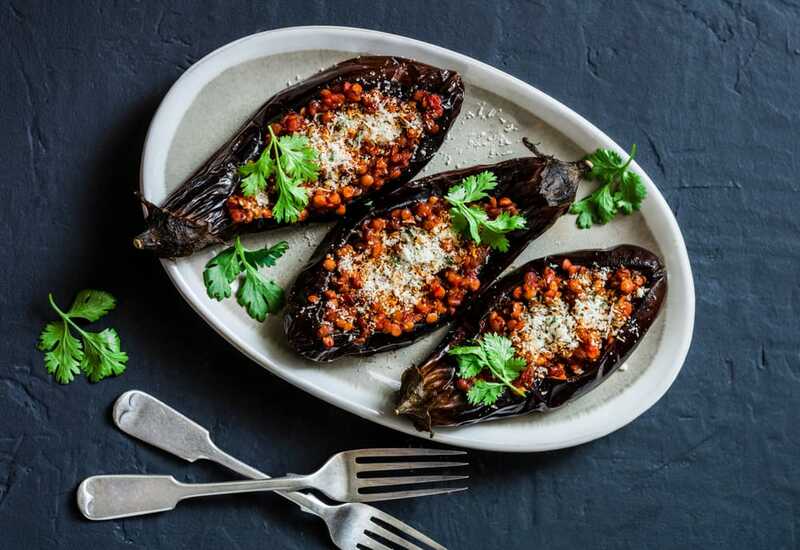 Baked eggplant stuffed with Moroccan-spiced lentils packs in big flavor, lots of protein, fiber, and it can be frozen for up to one month. 1. Preheat oven to 375 degrees. Set aside a 9×13-inch baking dish. 2. Add the Moroccan-Spiced Lentils, crushed tomatoes, salt, pepper, and paprika to a large saucepan or rimmed skillet. Heat over medium heat until bubbling and then reduce heat to a simmer. Cook for 5 minutes. Taste and adjust flavor as needed, adding more salt and pepper, or paprika for smokiness. 3. Use a knife to cut a divot out of the center of your eggplants, then use a spoon to scrape out a hollow center. 4. Heat a large rimmed skillet over medium heat. Once the skillet is hot, add the oil and the eggplant cut-side down and cover. Depending on the size of your pan, you may have to do this in two or more batches. Cook on one side for 4-5 minutes, or until slightly charred. Then, flip over the eggplant, cover, and cook for an additional 4-5 minutes. 5. Once the eggplant is soft and browned on the outside, place the eggplant, cut-side up, in your baking dish and top with the lentils. There should be plenty to fill the eggplant with, plus some overflow, which can be spooned into the dish. Top with panko breadcrumbs. 6. Bake uncovered for 30-35 minutes or until the eggplant is soft and the lentils are bubbling. The breadcrumbs should be browned. 7. Serve as is or it can be presented over rice. Garnish with fresh parsley or cilantro (optional) for color and flavor. 8. This dish is best when fresh, although leftovers can be covered in the refrigerator and kept for up to 4 days, or stored in the freezer for up to 1 month.